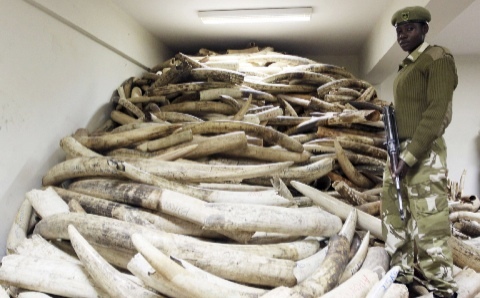 How strict is ivory enforcement? So I told them this little story. They are so strict that even the Juggernaut eBay is scared enough of them not to allow the word “ivory” to appear on their site in certain categories. If an item appears in certain categories on eBay with the word “ivory” in it, it sends out a notice for immediate review, and the listing can be immediately taken down. A few years ago I had a long discussion with eBay customer support about a verified antique Japanese okimono I tried to list because I did not understand why my listing was taken down by them when I had disclosed everything. They did not care that I had made the disclosures and that it was clearly pre-ban, antique ivory. What they cared about was that I had the honesty to use the word “ivory” in my listing! However, eBay’s fear of the US Government only goes so far! Their hypocrisy is tremendous, because if you don’t use the word “ivory” in your listing, you can still sell your real ivory pieces, regardless of age or animal, on their site with relative impunity. There are constantly a large number of real ivory pieces for sale on eBay if you know which key words to use to search. Also, the sellers are “cleaver enough” to use code words like “ox bone”, “bone, “wood”, or use no descriptive word at all, which has taught them that eBay will ignore their listings and not take them down, despite them being real ivory, let alone post-ban ivory. The sellers way around the inability to use the word “ivory” in their listings is circumvented by the use of specific search words and of very clear images and lighting angles in their listings, which show that they are selling real ivory or superior faux ivory. For example, nearly anyone can easily learn to identify real elephant/mammoth ivory in a good photograph by referencing the Schreger pattern/lines (the natural cross-hatched appearance found in all proboscidean ivory), which these sellers some times explicitly show in their images. Here is an excellent example from a listing on eBay today, January 23, 2013, exhibiting exactly this “allowed” behavior, note the search terms “Ox Bone” associated with clear Schreger lines seen on the face and around the neck of the carved figure, let alone the fact that this is clearly an elephant’s ivory tusk: http://www.ebay.com/itm/Huge-Solid-Ox-Bone-Raw-Tusk-L-K-Statue-Head-Sculpture-Bust-Okimono-Netsuke-/121056013400?pt=Asian_Antiques&hash=item1c2f802c58. I even offered my services to eBay’s legal team, to help purge the real ivory pieces on a daily basis from their site if they wanted to take their “ban” on ivory sales seriously. However, despite being given the eBay legal department’s phone number by the eBay representative, and leaving a message with my contact information and my offer of help, no one ever returned my call! After waiting in vain for a reply, I then called the USFWS and spoke to an officer who is a specialist in endangered species explaining everything noted above. They told me they have been trying to work with eBay for a long time on these issues, but were glad to hear my story and observations, as they had not known of this loop hole. As a final comment on how seriously USFWS, and in this case the State of New York, takes the illegal trade in ivory, please reference these two New York Times articles that address exactly that. Just this past year, two dealers in NY pleaded guilty to illegal ivory trading charges in NY. The ivory they had in their possession cost an estimated 25 Asian and African Elephants their lives due to poaching! The fines are far too small in my opinion! Tagged African ivory, Alaska, appraisals, Asian ivory, Buddhist Sculpture Appraisal Guanyin Guan Yin Kuanyin Buddha value, Chinese, Chinese antiques, Chinese art, Chinese artifacts, expert, fossil, fossilized ivory, high-end, ISA, Ivory Appraisals, ivory rules, Japanese, Minneapolis Institute of Arts, professional appraisal, Sino-Tibetan, Tibetan, valuation, Valuations, value, values, Why Credential Professional Appraisers should be used! What are the rules on fossilized ivory? Well, again, I premise this with, to have the most up-to-date information, you need to call the USFWS at 1-800-344-9453 and/or visit their website at:http://www.fws.gov, and also contact the proper department in your State Government. According to the USFWS, all fossilized ivory, from any animal, is legal to own, buy and sell, national and internationally, except when raw materials and cultural artifacts are taken from public lands, removed from archaeological sites, Native American (Indian) lands, or private lands without permission of the owner, i.e. any item that is acquired legally and under all applicable laws is fair game. There are no known international bans that I am aware of or any known laws that say otherwise, I would be glad to have input from anyone who knows more about this. However, if you are in a foreign country, it would strongly behoove you to check with that government before removing anything, as the pieces can be confiscated from you by US Customs or other US Government officials and repatriated back to the country of origin, and you will not get your money back, as it is your mistake. Also, generally it will not be legal to own, buy or sell pieces that arrive in the US when they violate other Governments export laws, and just because a dealer in China tells you it is legal to transport back to the US, what do you think their main motivation and knowledge base is anyway? The US Government will always blame the error on you, regardless of how much you plead your case by telling you that ignorance is not an excuse! Now, that being said, you must also understand that the average customs official and law enforcement officer is not an expert and has only minimal training with ivory, and so they generally will not know the difference between fossilized, contemporary or antique ivory, regardless of what they say, which is trouble for the possessor of the ivory item. Ivory identification is a highly specialized area of knowledge. The best thing you can do is to make sure it is well documented as being a legally obtained fossilized specimen – the main point, provenance, provenance, provenance. Your documentation is your trump card to legitimacy with the US and State Governments. If you are not sure, then ask a true expert for assistance. I truly hope this set of blogs is helping you to understand and untangle the mess surrounding ivory ownership, and it’s trade. Greg C. Brown, MS, ISA, CAGA. President, Greg C. Brown & Associates, Inc. Appraisal Services. Minnesota Sub-Chapter Chairman, The Explorers Club. Can you own, buy and sell elephant ivory in the United States? I preface all of what I say from here on within this blog on ivory with this statement, I am not the legal authorities, so to make sure you know the most current laws on these issues, you must contact the United States Fish and Wildlife Services (USFWS) for the up to date information at 1-800-344-9453 and/or visit their website at: http://www.fws.gov and the proper department within your State Government. Laws on ivory are confusing and hard to answer. The short answer to the question, can you own, buy and sell elephant ivory is “yes and no”, it depends on a number of variables and even the state you are in. So, to be as clear as possible I will quote directly from a USFWS fact sheet found at: http://www.fws.gov/international/DIC/species/afe/pdf/Ivory_Fact_Sheet.pdf. “In general, export of raw African and Asian elephant ivory from the United States is prohibited. Import of raw African elephant ivory, with the exception of sport-hunted trophies, has been banned since the 1989 moratorium. African elephant ivory can be legally owned or bought and sold within the United States providing it meets ESA requirements and State laws. Worked African elephant ivory acquired before its 1978 ESA listing or antique ivory (over 100 years old) may be imported or exported for noncommercial purposes or, in limited situations, for commercial purposes with a certification from the Service. To date, no commercial import of nonantique African elephant ivory has been permitted under the AECA. “African elephant ivory within the United States that was imported prior to the 1989 ban, imported as sport hunted trophies, or obtained as the result of Federal law enforcement action is considered legal. The key point here is that you must have the proper provenance and documentation for your pieces if you are going to practice any kind of trade in or transport of them. Basically provenance is the documented history of a piece from its origin to your current ownership. Without it, you may not be able to prove age, country of origin, date of importation, etc, which can make you legal susceptible to your piece being confiscated. You can not rely on family stories for this proof, as that is not provenance. 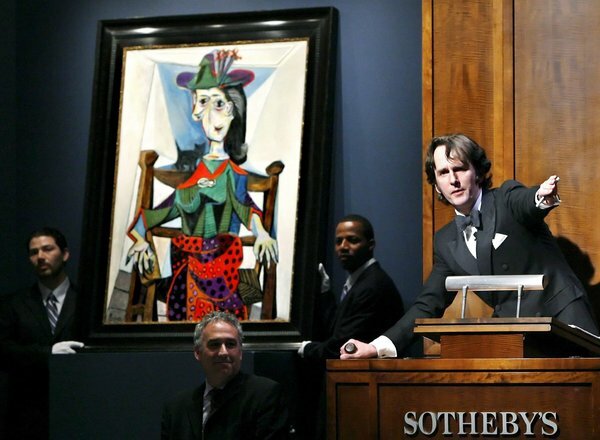 Provenance is critical to the appraisal process and achieving the highest appraised values. The lesson, keep all of your family notes, previous appraisal reports, receipts, photographs, etc. with the items, no matter how rough or poorly preserved. Tomorrow we will address fossilized ivory. Appraisals and the basics of CITES and it’s oversight of Ivory. Some coaching on CITES and what it’s purposes is. CITES is a legally binding, voluntary accord, between 176 Party Nations, for the conservation of approximately 30,000 species of wildlife (fauna) and wild plants (flora), in order to ensure their survival. It covers the legal and illegal trade in both living pants and animals, as well as their “products”, which include such things as ivory for carving, pelts for worship and clothing, spleens and bones for medicine and “ego” boosting. Unfortunately, many of these Party countries who are to enforce these rules on the importation, exportation and exploitation of fauna and flora, are also the worst offenders. If you have never truly considered the incredible number of elephants, rhinos, leopards, tigers, birds of prey, etc. 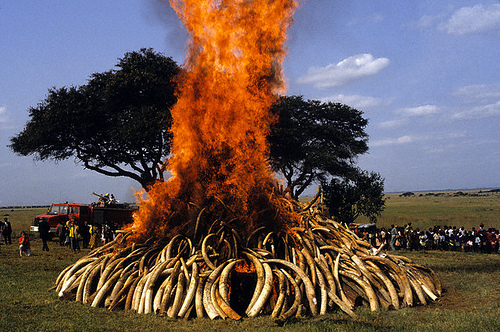 being poached, just look at a few of the images here, burning ivory, and I think you will truly be affected by the real size of the problem and the truth of the impending extinction of these animals, due to a proper lack of enforcement and to their “allowed” illegal trade.